I just got home from seeing The Force Awakens, and all I’ll share is that it was a Star Wars movie. Note that I cannot say the same for the Prequel Trilogy. It feels good to love Star Wars again. 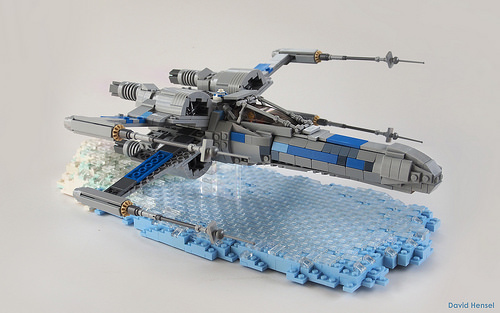 While several of us from the TBB team were off seeing Episode VII together, David Hensel posted his 21st build for the current round of Iron Builder — an X-wing in gray and blue to match 75102 Poe’s X-wing in black and orange. My critique of the official set — that the LEGO X-wing is missing the long, tapered angle of the nose forward of the cockpit — applies to David’s own design as well, and it’s a bit unfortunate that he doesn’t seem to have the excellent new X-wing cockpit to use. Nevertheless, this is a great rendition of the iconic fighter from the new movie.